General Formula: CnH2n+1OH, n = 1, 2, 3, ……. 1. 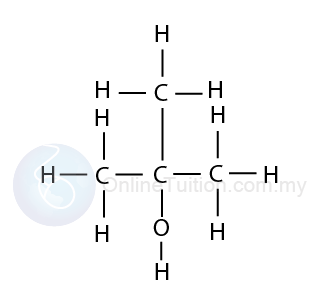 Alcohols are compounds in which one or more hydrogen atoms in an alkane have been replaced by an -OH group. The nomenclature of alcohol, like alkanes, is based on the number of carbon atoms in the molecule, but the suffix ‘ane’ in the nomenclature of alkanes is replaced with the suffix ‘anol’. The positions of the alkyl and hydroxyl groups that the attached to the carbon chain are shown by numbering the carbon atoms. The hydroxyl group must always get the smallest possible number. The boiling point of an alcohol is always much higher than that of the alkane with the same number of carbon atoms. This is because, the presence of the hydroxyl group gives extra force between the molecules, hence more heat energy is needed to overcome the intermolecular force when boiling. The boiling points of the alcohols increase as the number of carbon atoms increases. the number of carbon increases, the size of the molecule increases. more heat energy is needed to overcome the intermolecular force. The small alcohols are entirely soluble in water. 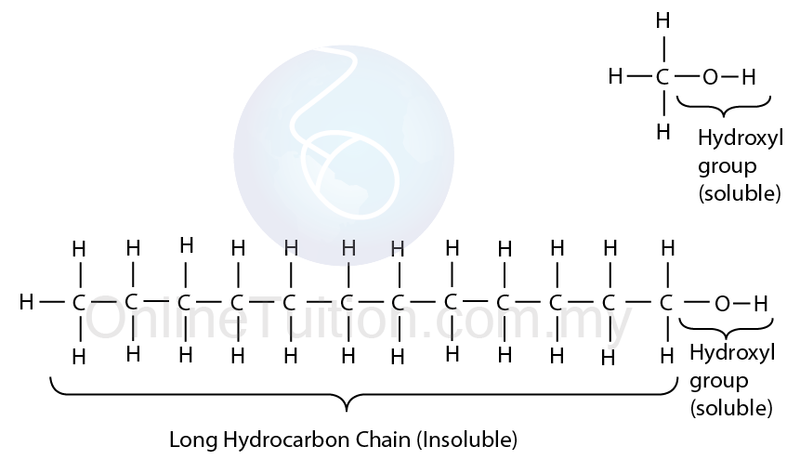 However, solubility falls as the length of the hydrocarbon chain in the alcohol increases. Every alcohol consists of two parts, the hydrocarbon chain which is not soluble in water, and the hydroxyl functional group, which is soluble in water. 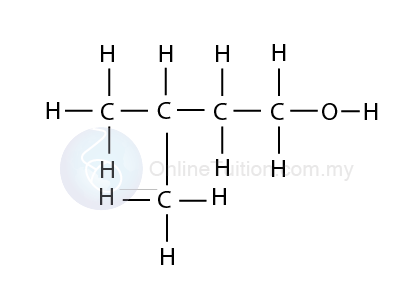 In short chain alcohol, the hydroxyl group plays a significant part in forming forces (hydrogen bond) in between water and alcohol molecule, therefore they are soluble in water. 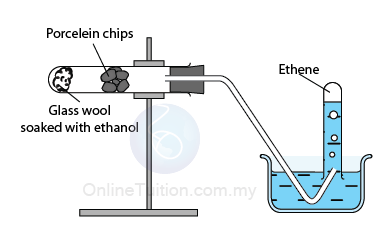 When we discuss the chemical properties of alkenes, we have learned that, when alkenes undergo addition reaction with steam, alcohol will be produced. 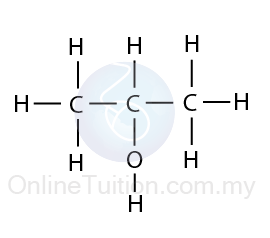 (see hydration of alkenes). 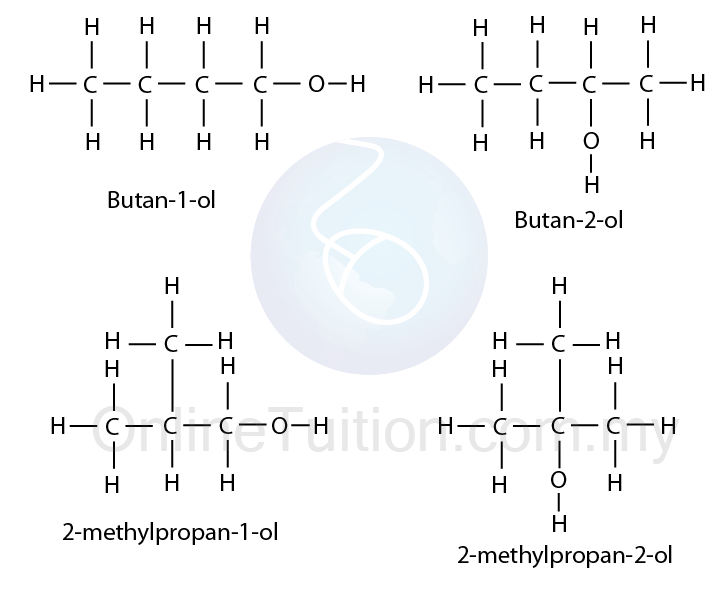 Equations below shows the hydration of ethene and propene to produce ethanol and propanol respectively. This method only applies to ethanol. 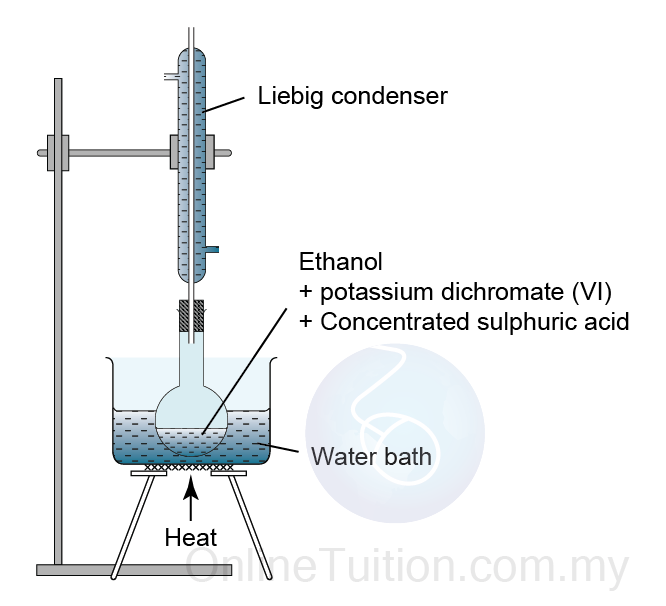 Fermentation is the chemical process which microorganism such as yeast act on carbohydrate to produce ethanol and carbon dioxide. Yeast is killed by ethanol concentrations in excess of about 15%, and that limits the purity of the ethanol that can be produced. As the hydrocarbon, alcohols undergo combustion with the presence of oxygen to produce carbon dioxide and water. Combustion of alcohol produces less soot compares to combustion of alkanes and alkenes due to the presence of oxygen in the –OH group. 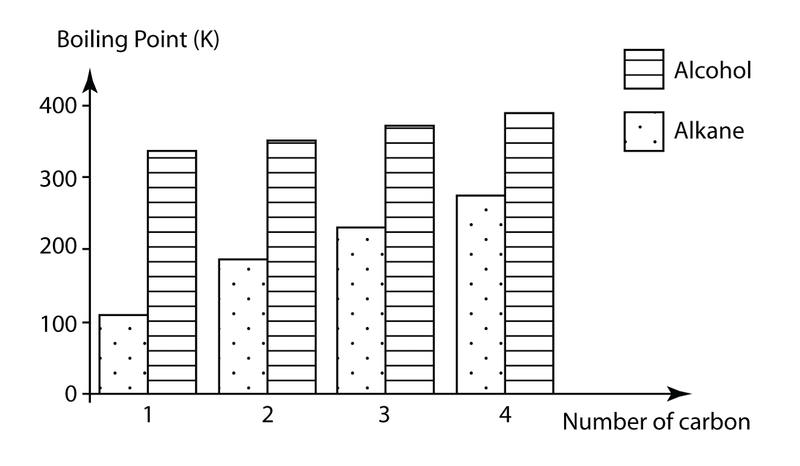 Owing to the presence of the –OH group, the percentage of carbon in alcohol is relatively low when compared with the percentages of carbon of alkanes and alkenes. We have learned the reaction of group 1 metals with cold water in Form 4 chapter 4, Periodic Table. The reaction of an alcohol with sodium is similar to this reaction. If a small piece of sodium is dropped into some ethanol, it reacts steadily to give off bubbles of hydrogen gas and leaves a colourless solution of sodium ethoxide, CH3CH2ONa. Sodium ethoxide is known as an alkoxide. In the reaction, sodium reacts with the -OH group of alcohol produces sodium alkoxide and hydrogen gas. When alcohol is heated, it will decompose to form alkene and water. 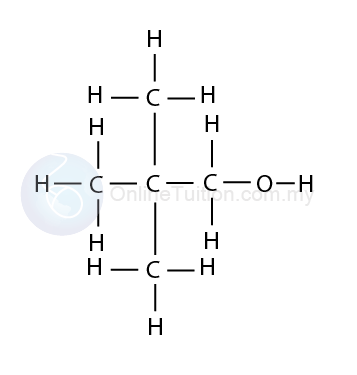 For example, heating ethanol will produce ethene, heating propanol will produce propene, and so on. 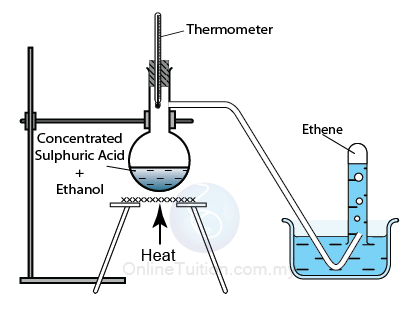 This process is called dehydration of alcohol. Alcohols can be oxidised to produce carboxylic acid when reacting with oxidising agents. For acidified potassium dichromate(VI), if oxidation occurs, the orange solution containing the dichromate(VI) ions are reduced to a green solution containing chromium(III) ions. For acidified potassium manganate (VII), the purple colour of potassium manganate (VII) decolourised. 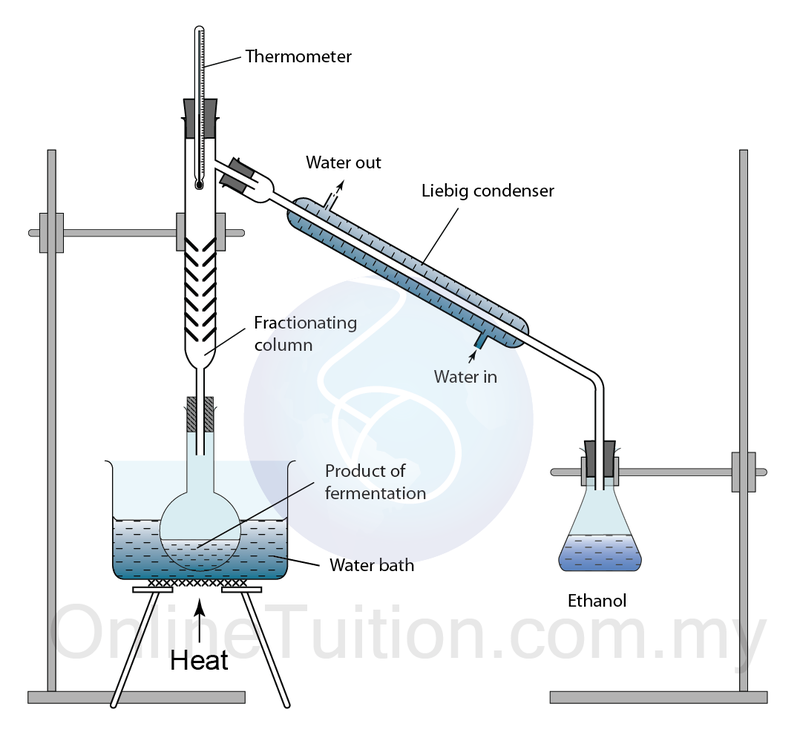 The alcohol is heated under reflux with an excess oxidising agent. The reflux technique used to prevent the alcohol vapour escape to the surrounding. When the reaction is complete, the carboxylic acid is distilled off.